A couple of these would appeal to your sense of humor, Sergio. I am SURE of it. :) And her mysteries are excellent too - but I'm assuming you've read those. My bride is a major Heyer fan and has read her entire works at least three times. It is amazing how many people have read and loved her books. Many years ago we attended an Almack Tea sponsored by The Georgette Heyer Society and ended up discussing Raymond Chandler with SF author Alfred Bester. Another Sf writer, Alexei Panshin, was greatly influenced by Heyer in writing his Anthony Villiers novels. Hi Jerry, I think Heyer has influenced many writers along the way. There's no one today who can duplicate the sort of thing Heyer did. She was an exceptional talent. I loved this book when I read it as a teenager, but Fredrica, the first one I read, remains my favourite. I think people often love the first one they read best. I didn't actually like the Talisman Ring when I read it years ago, as if I remember correctly, it is more of a regency thriller, and as a teenager I wanted romance! So newcomers should try several of her books, as they do vary. 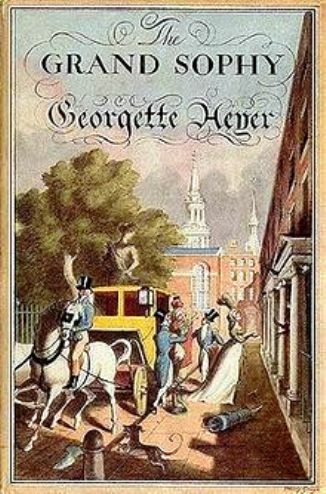 Well, that is the great thing (well one of the many great things) about Georgette Heyer - her books vary so. I've always thought THE TALISMAN RING would make a great operetta or even, a very funny farce what with all the opening and closing of doors and people popping in and out all over the pace. Ha! I love listening to THE GRAND SOPHY as an audible book and also love listening to FREDERICA. Both narrators are spectacular! This was the first of Heyer's Regency novels I read, and it's still one of my top favorites! I'd avoided her books for a while because I just didn't think anyone but Jane Austen could make the Regency setting interesting for me. But when half a dozen friends read The Grand Sophy and raved about it, I decided to give it a try—and didn't regret it! It's almost like Austen crossed with Wodehouse. Yes, absolutely! Austen crossed with Wodehouse. With a dash of Stella Gibbons. And the this is too that these stories don't suffer from being reread over and over. Yvette, I know how much you like Georgette Heyer's books and that's enough for me to read at least one of her books to begin with. A former colleague continues to swear by Heyer. Wish choice, no doubt. Try one, Prashant. They are such fun. Purely escapist reading. Our server here inopportunely hiccuped, Yvette. Please let me know if my previous comment made it thru the firewall. i read and loved the mysteries; bored, later, i turned to the society books and fell in love with those, also! i haven't read them all, but intend to before i croak.... many tx for reminding me of an extraordinarily brilliant writer! You're welcome, Mudpuddle. Yes, Heyer was extraordinarily brilliant. We tend to think of 'light' reading as just that, but it takes a fine hand to fashion these entertainments. Not to mention, the mysteries. I should try a few of these, Yvette. I have read most of Heyer's mystery novels, and liked them well enough, although it has been a long time since I read any of them. I have always assumed her other novels would be too romantic for me, but I have a friend who has been a big fan of Heyer's books for years and years. Once you fall for Heyer's books, Tracy, you never look back. Her Regencies are SO much fun. You won't go wrong with THE GRAND SOPHY or FREDERICA or ARABELLA or my top TOP fave: COTILLION. The other are all almost as good too. Give one a try, you won't be sorry. Great review! I particularly like Black Sheep but recently reread The Grand Sophy. I liked it more than when I read it as a teen. Yvette, I lost interest in Heyer a long time back but your wonderful review makes me feel like picking her up once again.